Imagine you win a free trip to Japan to search for 10 best matcha cakes in the Kyoto. Unfortunately, you don't like matcha, you feel nauseated every time you eat them. What will you do? I used to hate matcha green tea desserts and beverages. However, there's someone close to me who simply loves it. As a couple, we have set up rules inside and even outside the house. One is to order only one kind of dessert every date - "half for him, half for me". Every time we would dine in a coffee shop or restaurant that offers matcha green tea desserts, he'll get one. He wins not because he's the man of the house, because I allow him to choose. You know sometimes, we find it hard to choose from the many choices. Matcha cakes taste light compared to chocolate cake that are usually heavy and sweet. Imagine matcha tiramisu or this photo on top, the Kyoto Kotobuki Matcha Cake. How about matcha covered sansrival? The universe probably did something that changed my taste buds. One day, about three years ago my husband and I went on our usual couple date. He had something like Matcha Green Tea Frappe. My sweet husband got me the Matcha Green Tea Latte. It was followed by more trips to coffee shops and even Japanese restaurants offering matcha desserts and drinks. Then there's matcha ice cream which we both like. Today, green tea has been part of my evening routine. I also realized the health benefits of green tea into our body. Going back to the free trip to Japan, if ever given the opportunity I would search the best restaurants offering Matcha desserts in town. I have learned to love the unique flavors of matcha green tea. 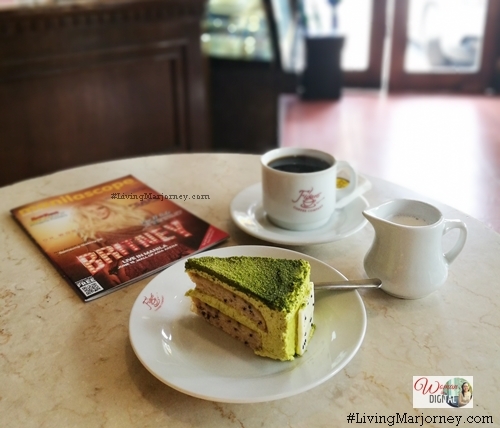 As of this writing, I'm having Kyoto Kotobuki Matcha cake at Figaro. It's a two layers of rich and moist coco-sesame cake symphony covered with a light, smooth and matcha-rich green tea mousse. 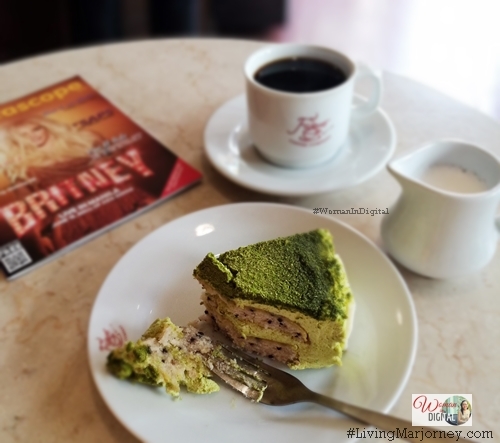 Have you tried the Kyoto Kotobuki Matcha cake at Figaro? How about the Matcha Green Tea Frappe or Latte? Do you have the same story like mine?